Capuchin monkeys are a subfamily of New World monkeys, the Cebinae. They are native to Central and South America. There are only two genera: Cebus and Sepajus. Cebus has the gracile capuchins, and Sepajus has the robust capuchins. Capuchin monkeys are active during the day and generally live and travel through trees. Capuchin monkeys live in Central America and South America. They make their home in trees, traveling during the day and sleeping in the trees at night. Capuchins live in groups of 10 to 40 members. These groups consist of related females and their offspring, as well as several males. Usually groups are dominated by a single male. The Capuchins in a group will groom each other and vocalize to communicate. The Capuchin group will be protective of its territory, marking a central area of their territory with urine and defending it against intruders. Females bear young every two years following a 160 to 180 day gestation. The young cling to their mother's chest until they are larger, when they move to her back. Adult male capuchins rarely take part in caring for the young. Within four years for females and eight years for males, juveniles become fully mature. In captivity, individual capuchins have reached an age of 45 years, although life expectancy in nature is only 15 to 25 years. Capuchins are the most intelligent New World monkeys. The tufted capuchin uses tools in a similar way to chimpanzees. It is one of the few examples of primate tool use other than by apes. When they see macaws eating palm nuts, cracking them open with their beaks, capuchins select a few of the ripest fruits. They nip off the tip of the fruit and drink down the juice, then seemingly discard the rest of the fruit with the nut inside. When these discarded fruits are hardened and brittle, the capuchins gather them up. Then they take them to a large flat boulder where they already have a few stones from a river. They use these stones to crack open the fruit to get to the nut inside. Young capuchins watch this process to learn from the more experienced adults. It may take a capuchin up to 8 years to master this skill. During the mosquito season, they crush millipedes and rub the result on their backs. This acts as a natural insect repellent. One experiment suggest they can distinguish between seeing and knowing, but this is not entirely accepted. A 19th-century organ grinder and his capuchin monkey. Capuchin monkeys can be recognized as the "organ grinder" or "greyhound jockey" monkeys. Capuchins are sometimes kept as exotic pets. Sometimes they plunder fields and crops and are seen as troublesome by nearby human populations. In some regions they have become rare due to the destruction of their habitat. They are also used as service animals, sometimes being called "nature's butlers." Some organizations have been training capuchin monkeys to assist quadriplegics as monkey helpers in a manner similar to mobility assistance dogs. After being socialized in a human home as infants, the monkeys undergo extensive training before being placed with a quadriplegic. Around the house, the monkeys help out by doing tasks including microwaving food, washing the quadriplegic's face, and opening drink bottles. 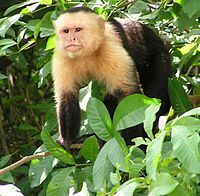 Capuchin monkeys are featured in the movies Outbreak, Pirates of the Caribbean: The Curse of the Black Pearl (and its sequels), the Zookeeper film, George of the Jungle, and The Hangover Part II. Ross Geller (David Schwimmer) on the NBC sitcom Friends had a capuchin monkey named Marcel. The diet of the capuchins is more varied than other 'New World' monkeys such as spider monkeys. They are omnivores, eating not only fruits, nuts, seeds, and buds, but also insects, spiders, birds' eggs, and small vertebrates. Capuchins living near water will also eat crabs and shellfish by cracking their shells with stones. Capuchins are darkly black or brown except for the face, throat and chest, that are white coloured. They reach a length of 30 to 56 cm (12–22 in), with tails that are just as long as the body. ↑ "Black-faced Capuchin". Amazonian Rainforest. Monkey Jungle. Retrieved 2008-10-13. ↑ "Saving the monkeys". SPIE Professional. Retrieved 1 January 2016. ↑ Boinski S. Quatrone R. P. & Swartz H. 2008. "Substrate and tool use by brown capuchins in Suriname: ecological contexts and cognitive bases". American Anthropologist 102 (4): 741–761. doi:10.1525/aa.2000.102.4.741. ↑ Life series. 2009. Episode 1. BBC. ↑ Valderrama, X. et al. (2000). "Seasonal Anointment with Millipedes in a Wild Primate: A Chemical Defense Against Insects?". Journal of Chemical Ecology 26 (12): 2781–2790. doi:10.1023/A:1026489826714. ↑ Kuroshima, Hika; Kazuo Fujita; Akira Fuyuki; Tsuyuka Masuda (March 2002). "Understanding of the relationship between seeing and knowing by tufted capuchin monkeys (Cebus apella)". Animal Cognition 5 (1): 41–48. doi:10.1007/s10071-001-0123-6. ISSN 1435-9448. PMID 11957401. http://www.springerlink.com/index/ELTR6PV6B8RVTPDA.pdf. ↑ 10.0 10.1 Lineberry, C. "Capuchin Monkeys, Spinal Cord Injuries, Volunteering, Trained Monkeys". AARP. Retrieved 2008-10-13. ↑ "Capuchin Monkeys at Animal Corner". Retrieved 2012-06-25. This page was last changed on 16 June 2018, at 14:26.